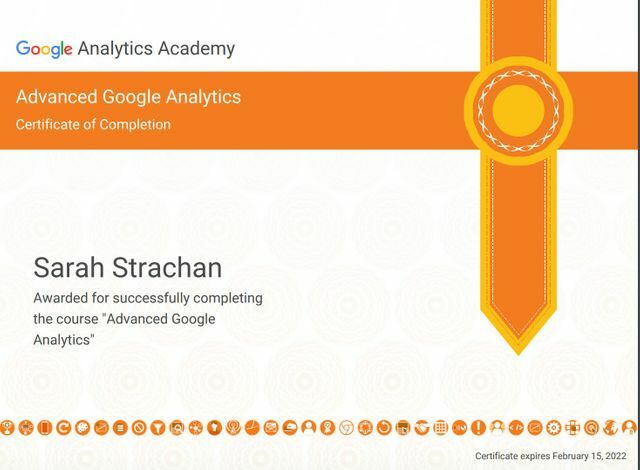 Today I completed the Google Analytics Advanced Course. The advanced course deals with more complex data analysis techniques and builds on a beginners understanding of Google Analytics I completed a couple of weeks ago (you can read more about that here). Segmentation – Google Analytics allows you to build segments that show specific data such as: demographics, technology, behaviour, traffic sources, and much more. What is really useful is that you can add multiple segments to a single report for comparison. For example, you can compare data from different marketing campaigns to see which is more effective. Attribution – Google Analytics uses attribution modelling to help you measure how different marketing campaigns work together to produce conversions. Instead of just crediting the last marketing activity that led to the conversion, Google Analytics is able to tell you which prior marketing activities played a part in the conversion process. Benchmarking – Benchmarking reports lets you compare your data with anonymised industry data from other companies. This can give you a baseline to measure your own business and gain insight into your industry. Google Analytics offers many ways to configure and manipulate data to measure business objectives. What is important going forward is to be able to understand the business objectives of your company and how you can use the data collected to produce meaningful and actionable insights. Next up, Google Analytics for Power Users. Get a deeper understanding of your customers. Google Analytics gives you the free tools that you need to analyse data for your business in one place.